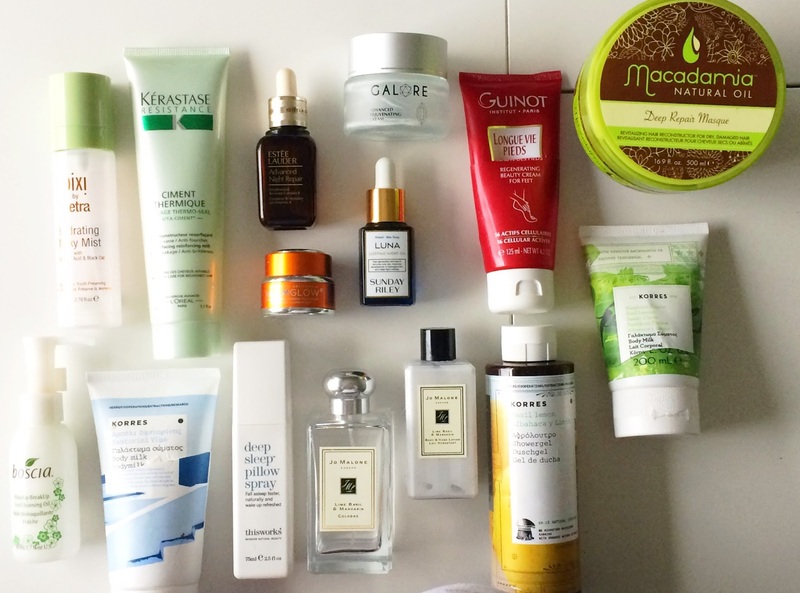 Empties & speedy reviews #30 featuring Jo Malone, Korres, Pixi, Kerastase & more! It's time for my monthly empties post! If you are new around here, in these posts I show you everything I've finished recently and share my thoughts on them and whether or not I would repurchase. I have a good mixture of skincare and bodycare this month and a few miscellaneous thrown in for good measure too! Let's get started! Sunday Riley Luna Sleeping Night Oil: I bought this as part of a set in Sephora, which also contained Good Genes. Initially, I wasn't crazy about this retinol oil but then Anne from Linda, Libra, Loca said to use it on clean, dry skin before any further products, rather than the traditional way an oil is used in a skincare routine. When I began to use it in the correct way, I could see a difference in my skin - pores were refined, my skin generally looked bright and smooth so I could definitely see why it was so hyped. It is an expensive product and now that it is finished, I do miss it from my routine and I may repurchase but I am very tempted to try Pestle & Mortar Superstar Retinol Night Oil, which is getting quite a bit of hype also and works in the same way and is less expensive. Estée Lauder Advanced Night Repair Serum: Regular readers will know that this is my favourite ever skincare product! If I could only own one luxury skincare product, this would be it because it does it all - it hydrates, brighten, plumps and heals my skin and I cannot be without it. Although it is quite pricey, a little goes a long way. I will definitely repurchase. Glamglow Flashmud: I bought this mini tub of brightening mask in Sephora back in June but it is now available to buy in Boots. This mask made my skin look a little brighter but it isn't as good as some of my other masks, which brighten, exfoliate and smooth my skin so I won't repurchase. Boscia Makeup-Breakup Cool Cleansing Oil: I absolutely love this cleansing oil. It dissolves all of my makeup, even every last trace of my heavy duty mascara and doesn't sting my eyes at all. Once I add water to emulsify and then rinse, my skin is ready for my second cleanse. A little bit of this oil goes a long way and if Boscia products were available to buy in Ireland, I would repurchase in a heartbeat but until then , I will have to wait until I am next in the U.S.
Galore Cosmetics Advanced Rejuvenating Cream: This beautiful moisturiser was kindly sent to me and I have really enjoyed using it. I reviewed in full here but the short version is that this cream makes my skin really supple, very moisturised and plump. I will repurchase at some point. Pixi Hydrating Milky Mist: Regular readers will know that I adore this hydrating spray because it actually works. It really adds some must needed moisture to my skin and is the perfect product to use post exfoliation to balance the skin but it is also really nice for refreshing my makeup during the day. This is my 4th or 5th bottle of this product, which speaks volumes as to how much I love this product. I will definitely repurchase. Kerastasé Resistance Ciment Thermique: This heat protectant is a really brilliant product for anybody with damaged or coloured hair - a pea sized amount of this heat-activated product is enough to protect my hair from breakage when using heated tools. My hair always looks bouncy and swishy when I use this and I adore the fresh scent. I love all of the products in the Kerastase Resistance range and will definitely repurchase. Macadamia Natural Oil Deep Repair Masque: I have repurchased this more times than I can remember because it is the best hair mask that I have ever used on my dry, damaged hair. It leaves my hair very soft, smooth and glossy and no other mask that I have used works as well as this one does. I have already repurchased. Korres Basil Lemon Shower Gel: I was kindly sent a bundle of Korres products and I especially adore the Basil Lemon range because the fragrance is very uplifting and refreshing and, more importantly, authentic rather than synthetic. This shower gel lathers really well and cleans my skin without stripping it. I love it and will definitely repurchase. Korres Basil Lemon Body Milk: This body lotion is light in texture but really delivers in terms of moisturising the skin. Again, I adore the fresh, uplifting scent and what I really love about Korres products is how affordable they are, given that they perform as well as other more expensive products that I have tried. This is another definite repurchase. Korres Santorini Vine Body Milk: I love the scent of this body lotion because it is both fresh and sweet at the same time. I can definitely imagine being addicted to this scent in the height of summer! Like the Basil Lemon Body Milk, it is very moisturising, yet light in texture and absorbs quickly. I will repurchase in summer! Jo Malone Lime, Basil & Mandarin Body Lotion: This was one of my birthday gifts and I was delighted to receive it as it is one of my favourite scents from Jo Malone. It is a very invigorating, uplifting scent without any sharpness. A small amount of this lotion goes a long way and although it is highly fragranced, it is really moisturising. I would love to repurchase but it is more of a treat purchase! Guinot Rejuvenating Foot Care: I bought this during the Feel Unique sale during the summer and I have really enjoyed using it. It is extremely moisturising and has kept my feet really soft throughout the last few months and has lasted so much longer than any other foot cream I've ever used. It now seems to be discontinued so I can't repurchase but I generally don't use very expensive foot creams anyway as there are so many great budget options. Jo Malone Lime, Basil & Mandarin Cologne: This is the fragrance that started my love affair with Jo Malone - I absolutely adore this scent. It is zesty without being too sharp and is very uplifting and refreshing. I love to wear it alone but it also works really well with Wood Sage & Sea Salt - my other favourite Jo Malone scent. I am hoping that I might find one of them under the tree this Christmas because I really miss having both of them in my collection! This Works Deep Sleep Pillow Spray: I can't tell you the number of bottles of this and the Sleep Plus+ Pillow Spray that I have gone through! I literally cannot sleep without this spray! I adore the calming scent and within a few minutes of spraying this on my pillow, I am in the land of nod! I highly recommend this to anyone who has problems drifting off. I have already repurchased. If you have made it this far, well done and thank you! Have you used any of these products? What have you finished recently? I'd love to hear in the comments below!